Hello everyone, Fran here again and this is what I am being told is called my travel blog. Last month me and my wife ( Agnes) went on a 2 week trip to Cuba, and stayed at an all inclusive resort outside Havana. My wife loved the trip, although she rarely left the resort. I can’t really blame her though; unlimited booze and food, grilled sandwiches down by the beach and roasted whole animals inside for dinner. But just outside the resort was the lively hustle and bustle of Havana life, with the sight and smells that make it famous. I strolled away from the resort one day, and right opposite us I found an old lady sitting on a stool with a flaming barrel in front of here and a pile of plantains at her side. I bought a bag full of these dried, baked plantains and they tasted like a sweet potato chip. A legendary snack that you will find in close proximity to any bar is the chorizo slider. According to local history, workers at a local sausage factory would take a small bit of meat and fry it up to taste and make sure the flavour was right. Now this tasty little burger is a staple, and something I am missing dearly. Any trip to Cuba is not complete without a classic Cuban Sandwich. For this, the sandwich needs to have the basic five ingredients ( ham, mustard, swiss, roasted pork and pickles). You then squash them all in between two slices of cuban bread. The best way to have one of these is grilled, and pressed down; either with some sort of sandwich press or a hamburger press. If you go to Cuba, try these foods out. 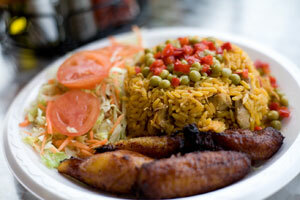 If you don’t go to Cuba, then order these foods from the cheapest Cuban restaurant in your neighborhood. Thanks everyone, I now get my steak and potatoes.